In August we crushed our dear old Toyota. Luckily speeds before the accident were slow on a rather small street, so nobody got hurt. Our insurance covered the damages. The company refused to mend our car but rather paid money for it, and asked us to go and buy a new car. That meant some extra spendings, and before all we needed to find a new car. In order to find one we contacted our mechanic on Machans beach and asked whether he has anything. He did. Without much thinking we got one of the two cars he was helping to sell at the moment. 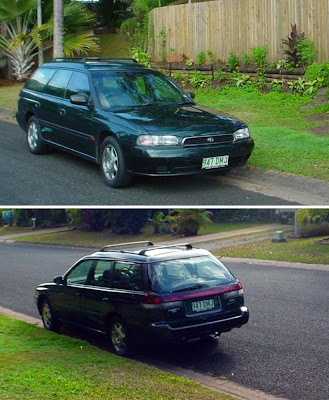 For those interested: it's 1996 model of Subaru Liberty GX Enduro (automatic). The engine is 2.2 as the Toyota had only 1.3 litres. We just hope that this is not going to eat double the petrol. At least there's enough space for the dogs in the back, and all the shoppings from Bunnings. Tow bar and roof rack will allow me to get a bicycle carrier so that I could do part of my daily commuting by bike. Will I actually do it, remains to be seen. I would love to but it's a question of time. My morning walk and working in the garden takes so much time in the morning that I don't like sacrify it to cycling. If I would cycle, I would need to leave home about 20 minutes earlier than I do when travelling in Nancy's car.